Everything you need to know about plastic pallets. To maximise your profits it’s important to get the most out of your packaging, logistics and shipping processes. This is ever increasingly meaning plastic pallets, as demand grows and business opt for these instead of traditional wooden pallets. The guide will provide you with all the information you could possibly want or need to know about plastic pallets. From designs and standards to shipping and buying tips. This will enable you to make better informed decisions and grow profit margins thanks to improved packaging, logistics and shipping processes. From pallet designs to standard sizes, from shipping, importing and exporting to weight capacities we have it covered. Take your time and browse through the guide or use the quick jump chapters below to get straight to the answer you need. When it comes to choosing plastic pallets, you need to consider which type is most suitable for your business. You will generally be looking at either nestable or stackable pallets, but within the categories there are a variety of sizes and design options to choose from. As well as factoring in the type of pallet that you require, you also need to consider the cost implications. There are a number of pallets available that are designed to accommodate all budgets and business needs. Stackable pallets are particularly lightweight but do have a higher initial cost than nestable plastic pallets. The bottom of these pallets has a solid base, which enables you to stack them on top of each other. They can be stacked in this way when both full and empty, as the secure bottom has been designed to protect goods. The bottom of stackable pallets can be configured in a variety of ways, depending on the type of handling equipment in operation and how the actual pallet is to be used. They are especially useful in sectors that utilise racking or need to double-stack, including within warehousing facilities. These pallets are most often used within a closed loop system, as it is more cost-effective to return the empty pallets as part of the distribution process. They take up more space when empty than a nestable pallet, but their advantages mean they’re still useful in specific industries. Their heavy-duty nature makes them ideal for exporting a variety of consumer goods, as well as food, drink and pharmaceutical products. As well as looking at the various types of plastic pallets that are available, you also need to factor in the cost. Nestable pallets are generally cheaper, but there are still stackable pallets that will meet your budget and requirements. Look at the overall long-term costs, as plastic pallets are durable and can be reused numerous times, reducing the cost per unit. Once you understand the different styles of plastic pallets, it will be considerably easier to choose the right option. By selecting the right type of pallet, your distribution process will run far more smoothly. Plastic pallets are an extremely cost-effective and durable method of transporting goods. You might think that all pallets are the same, but there are six distinct versions of plastic pallet. Each one has its own unique advantages and is better suited to particular applications. What are the different types and how can they best be used? This is the strongest type of plastic pallet available. They feature a bottom with either runners or a picture-frame design, enabling them to carry heavy loads. 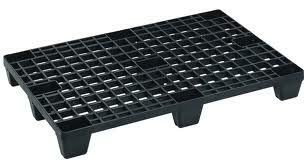 Nestable plastic pallets are extremely useful within the distribution industry. They take up much less space when empty than other types of pallets, as the legs go inside each other. This makes them far easier to transport on the return leg and each truck can fit more of the pallets on, lowering costs. When they’re stored in a warehouse, they use only a quarter of the space of other pallets. These types of pallets can be put inside each other when they’re not in use, which saves space both during transportation and in the warehouse. They create an efficient and safe stack that reduces the amount of floor space needed and so decreases the cost of storing and transporting empty pallets. Nestable pallets create an efficient distribution process, as more pallets can be fitted on to the trucks. This in turn limits the environmental effects, as fewer trucks and journeys are required to transport the pallets back to the original source. This helps to reduce the overall costs of the pallets, as they can easily be stored rather than having to buy new pallets every time. Choosing nestable pallets is a good option for companies which are distributing goods, either within one country or globally, as they are efficient for use in both trucks, ships and air freight. They can be utilised by a range of different industries, including pharmaceuticals, food and beverages, automotive and other consumer goods brands. The top of these pallets is made from solid plastic, making it a strong and durable option. It can be manufactured in a number of different versions, including pallets with reinforcement bars or perimeter lips, to help with safe handling and storage. As the top of the pallet is solid and smooth, they are far easier to clean than other models. This makes them ideal for applications where hygiene is of paramount importance. With so many different types of plastic pallet available, it’s important that you consider how you’re going to use it. Your specific handling requirements will enable you to decide which pallet will suit your needs the best. Pallets come in a range of different styles and sizes, depending on the requirements of the customer. Plastic models can be classified as Euro pallets, non-standard pallets or standard pallets. Pallets manufactured from plastic offer a number of advantages over those produced from wood. They are resistant to water, insect infestations and mould and don’t require treating. Plastic models are durable and can be re-used. They are also easy to clean, making them suitable for more hygienic requirements, including the food and pharmaceutical industries. Plastic pallets can be made from recycled components and can also be recycled themselves when no longer needed. The Euro pallet is the standard size of pallet that is used for transporting goods across Europe. Many companies will also look for businesses outside of the Continent to use them when importing goods. This makes it considerably quicker and easier for the importing company, as there is no need to repack goods on to Euro pallets when they arrive. A Euro pallet is also easier to transport and move around a warehouse using the standard equipment. This reduces the cost of transporting the goods and increases the productivity levels. Euro pallets can be re-used and are manufactured to a high quality, making them extremely durable. 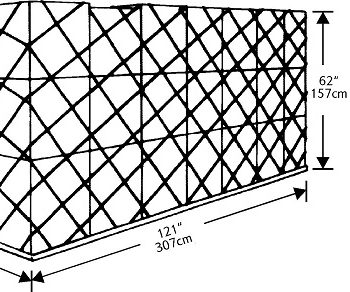 A standard plastic pallet measures 1200mm x 1000mm. They are available in a range of different specifications and designs, depending on the requirements of the customer. They can be produced as a budget option which is more lightweight, or alternatively there are heavy-duty and reinforced models for heavier loads that are stored in high rack locations. Lightweight models are designed to be stacked on top of each other, which saves space when they’re not in use. Standard pallets that are produced from plastic can be specifically designed for use in hygienic environments. This makes them suitable for the food and pharmaceutical industries, where hygiene levels are extremely strict. Standard pallets can be used for transporting goods globally, when the restrictions of the Euro pallet are not required. For customers who require different sized pallets which are produced to a range of specifications, there are non-standard models. These offer the same advantages as a standard pallet but without the restrictions of set dimensions. This makes them more suitable for companies that have smaller storage requirements. Rather than having a great deal of empty space on a pallet, a smaller model can be used. They are also beneficial for companies that have a lack of storage space, as the pallet can be more closely matched to the area available, enabling it to fit into the space. Pallets that are made from plastic can be used in many of the same ways that wood pallets are utilised. However, they offer more benefits and don’t have the same disadvantages, making them suitable for a wider range of markets. Whilst wooden pallets are still common within many companies, a lot are now turning to plastic pallets, recognising the added flexibility and efficiency they bring with them. Unlike wooden pallets, which are one colour, plastic ones come in a variety of pallet colours, allowing a company to incorporate them within their business so as to improve the efficiency and accuracy of their processes. There are a variety of advantages to using plastic pallet colours to speed up the processes within your organisation. Here are just some of those. If you give certain pallets a colour, managers, administration staff and warehouse workers will be able to see exactly which pallets have been distributed in the warehouse and where they are. Instead of having to individually scan barcodes to find out the contents, staff will know exactly which department the plastic pallets need to go to. This is also a huge benefit when it comes to doing internal audits or stock checks, as it’s much clearer what stock is in the warehouse, even when the pallets are located high up on the shelves. As they’re colour-coded, the pallets can be easily distributed and organised ready for shipping. Workers will understand which colour pallet needs to be used for each delivery, and they will be able to easily coordinate these shipments. With the use of different coloured pallets, all of the materials a business uses can be separated quickly and easily. When certain processes or materials are associated with a certain colour, this allows to staff to go straight to the pallet colour they need in order to complete the job. Again, this reduces the time taken to read individual labels or to scan barcodes. Because the contents of the pallets can be easily identified, it can also help to reduce the risk of cross-contamination within warehouses that are dealing with food, chemicals and so on. They are easily identified, so staff know which area the pallets need taking to, and they won’t be left in areas that could pose a risk to the safety of the products within them. Where you have a large department store that has various items, such as home ranges and clothing lines, having everything delivered in specific pallet colours will enable you to distribute this to the relevant department in the store. Furthermore, if you have different stores located in different areas, each store can have a different-coloured pallet so staff know exactly where that particular pallet needs delivering without having to look into it on the system. 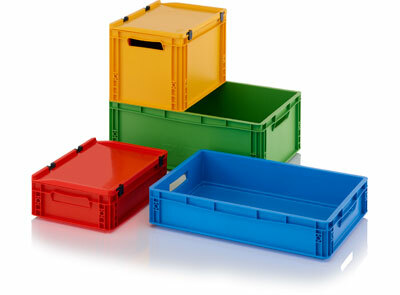 A lot of pallet companies now offer you the option of painting your plastic pallets in specific RAL colours. This gives you great flexibility when it comes to colour-coding your pallets, allowing you to tie it in with any particular colour schemes you currently use or to help enhance your brand image. Plastic pallets are lighter and more durable than wooden ones and cause fewer workplace accidents for this reason. However, the weight a pallet holds depends on the material from which it is made. 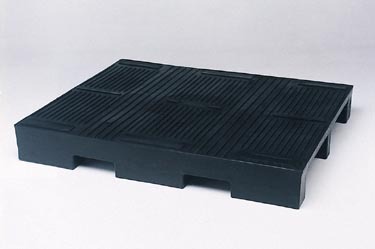 High-density polyethylene pallets can support a wide range of weights. They stack well and securely and so can be moved easily with forklifts or pallet trucks. When you are dealing with air freight, there are specific pallets and containers that you must use. The aircraft have precise requirements for the types of loads that they can accommodate, and each individual pallet has been designed to fit into the various types of aircraft. This ensures that cargo can be loaded and unloaded with minimal delays. A pallet or container that is to be loaded on to an aircraft is referred to as a unit load device (ULD). A number of different elements can be loaded on to the ULD and securely fastened. This enables cargo to be loaded all at once, rather than on individual crates. By using this process, it will take less time to load the aircraft, minimising any delays on the ground. By loading the goods on to ULDs before they enter the aircraft, there is less risk of them becoming damaged whilst in transit. The pallet or container is designed to work efficiently with the handling equipment at the airport, which moves the goods around on the ground and loads them on to the aircraft. This makes it far quicker to load the cargo than it would be if the individual components were manually loaded. ULDs have also been designed to fit exactly into the spaces provided within the aircraft. They can be used on both passenger planes and specially adapted cargo aircraft. As they fit precisely, it limits the amount of space that is wasted, thereby maximising the efficiency of the plane. Some types of ULDs can be used on different aircraft, which enables them to be quickly transferred between planes if necessary. However, there are some ULDs that only fit on to specific planes. It’s important to determine the route and type of aircraft to be used before the cargo is loaded on to a pallet or container. Plastic pallets are increasingly popular for transporting freight around the world. Recent improvements in the design and manufacture of pallets mean that they now have considerable advantages over wooden pallets, especially when used for air freight or other international transport methods. Although new plastic pallets may initially cost a little more than wooden pallets, their long term benefits are considerable. 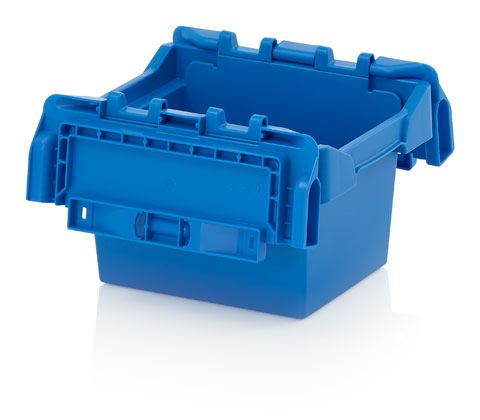 Plastic boxes, plastic crates and other easily stackable storage containers are similarly used for transporting goods. Plastic is much lighter than wood. Whether you are transporting goods by air, land, or sea, the heavier the package, the more it will cost. Jet fuel in particular is expensive at the moment, and costs are likely to continue to rise. The new plastic pallets are much sturdier and more stackable than previous variants, which in combination with their lighter weight makes them the ideal choice for transporting goods by air. They balance the weight of the load across their wide bases, rather than the narrow runners of most wooden pallets. This further enhances load stability. The light weight of the plastic pallet has the additional benefit of reducing your carbon footprint and the environmental impact of your business. Plastic pallets have a much longer lifespan than wooden pallets. New plastic pallets can be used over and over again; some have a lifespan of up to 10 years. They are also easier to handle, as they are lighter and they don’t splinter and cause injury. The durability of the plastic pallet means that it can be used and reused, saving you money and fuel each time. This may be the most important advantage that plastic pallets have over wooden pallets in the international logistics market. 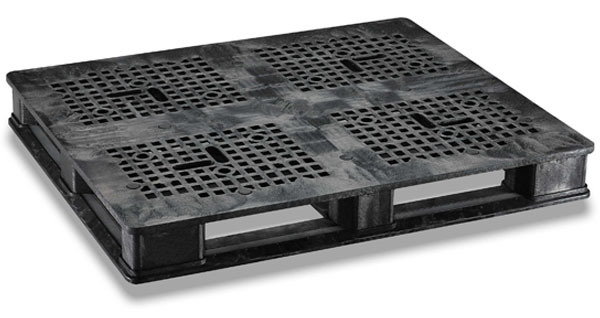 Plastic pallets are hygienic and don’t deteriorate in damp or difficult environments. They don’t harbour fungi, mould, bacteria or insects and are easy to clean or disinfect. This is why they are not subject to ISPM15 regulations, which require wooden pallets to be heat treated and stamped if they are to be used for goods coming into the EU. It also makes them suitable for exporting goods to Australia, Canada and the US. Because plastic pallets are moulded, they are absolutely uniform in size, which makes stacking them far easier and also allows for more precise load calculations. Distribution companies across the world are recognising the many benefits that plastic pallets bring to their businesses. They are a cost effective solution to the problem of increasing fuel prices and the requirements of a global marketplace. One of the most common forms of industrial packaging, pallets are widely used across the globe to transport a huge range of goods. Strong, durable and reusable, pallets come in different shapes and sizes. They offer an affordable and versatile method of transporting goods from place to place, so it is no surprise that thousands of pallets are moved around the world every day. Most companies will use wooden or plastic pallets for shipping at some time or other. One of the most versatile types of pallet is the Euro pallet, otherwise known as the EUR pallet. Euro pallets are the standard European size and shape of pallet, as set out by the European Pallet Association (EPAL). When you think of pallets, you probably imagine the wooden type, which are cheap to manufacture and can be recycled once they come to the end of their life. But pallets can be made out of different materials too. The aim of any pallet is to get your goods from A to B with the minimum of effort and the least chance of getting damaged. Wooden pallets, although they have their benefits, are prone to splintering and breaking, as well as being liable to damage caused by the elements. Nobody wants to see rotten wood and rusty nails when they’re loading pallets. Plastic pallets may provide the answer. Made out of durable plastics which are resistant to damage, they offer a reliable method of transporting goods which can be used time after time without issues. If you use plastic pallets for shipping, you can be assured of certain benefits. Being resistant to water and not susceptible to water damage, they can be washed to ensure they remain in tip-top condition – important if you’re transporting goods which need to be kept clean. This ability to withstand water damage also means they can be stored outside, where the rain and snow will not affect them. It also means you can use them in all weather conditions without having to worry about them rotting. Pallets made of plastic are anti-slip, having grooved surfaces, which gives you an additional level of safety when transporting goods. They are also shock-absorbent, which means they will not easily be damaged during the inevitable knocks and bashes experienced while being moved. Unlike timber pallets, the plastic version does not contain any sharp nails or edges and is not going to produce splinters, meaning they are safer to handle and less likely to cause damage to fragile packages. In addition, should you be unfortunate enough to experience a spillage of toxic material while transporting hazardous items, your plastic pallet will not absorb the spillage – a careful wash and they will be available for use once more. Unlike wood, they are unlikely to be damaged by spillages, either. They are long-lasting, too – a typical plastic pallet will last more than 10 years. After this, they can be melted down for recycling and making into something new, so they are no less environmentally friendly than timber ones. And they have one more advantage over their wooden counterparts: some countries have strict laws regarding what types of timber can be allowed through their borders. If your pallets are made of the wrong type of wood, it could well result in expensive and time-consuming delays. So next time you’re looking to source pallets for your business, you could do worse than bear plastic in mind. Cleaning your plastic pallets is a notoriously tricky task, but an essential one. Those corners, nooks and crannies can be hard to reach, especially when you’re talking about the sand, grit and dust that can easily collect in them. Is it best to outsource this cleaning or do it yourself, and how can you get those corners truly clean? Read on as we explore this often overlooked issue. The good news is that pallets made from plastic are incredibly robust and durable, which is what gives them such a huge advantage over traditional wooden ones. It also means that you can use heavy-duty detergents and jet washers and it won’t cause any damage or erosion to the plastic. There are some companies out there that will clean your plastic pallets to a very good hygienic standard and will also dry them and return them to you as good as new. Obviously, there is a cost attached to this that at first glance may seem high, but when you consider the man-hours it will cost you for a member of your own staff to clean the pallets, it may actually end up being cost-efficient. Companies with a very high number of pallets may also find this is a cheaper option overall. If you only have a few plastic storage pallets, or perhaps you have a situation where you have staff on-site that need to fill gaps in time, then doing it yourself is a good idea. Firstly, make sure you are in a well-drained area, preferably outside, as cleaning pallets is a messy and wet activity. Secondly, find a pressure washer, or even jet attachment to a hose, which will be essential in shooting dirt away from seams and corners. Also use a good disinfectant/detergent. Any all-purpose detergent will do the job. Make sure your staff member has a pair of gloves so the detergent and water doesn’t irritate their hands. Also ensure you have put out clean pallet racks to dry them on rather than letting them dry on the floor, where more dirt and grit may attach to the wet pallets. Getting your pallets clean is essential, as dirty pallets can pose a health and safety risk to consumers and staff. Whether you go for outsourcing or do it on-site is a simple calculation about the number of dirty pallets you have to be cleaned, the spare man-hours you have available and the costs involved. Either way, make sure that cleaning plastic pallets is a well-established facet of your general cleaning rota. Aim to clean pallets on a regular basis, but also allow for them to be cleaned on an ad hoc basis if they need additional cleaning. Buying pallets is not as simple a process as you might first think. When you begin to look into the pallet market, you might presume that all pallets are the same, but this isn’t the case. There are lots of areas that you need to consider. Spending time researching the market will ensure that you select the right type of pallet for your requirements. The budget will always be a key consideration whenever you’re buying goods for your business. However, when it comes to purchasing pallets, it shouldn’t be the only point you consider. Buying an extremely cheap pallet will be a false economy if it falls apart after one job. A less stable pallet will also be more likely to damage the goods it’s transporting or might not be suitable for your specific handling equipment. This would end up costing you more by the time you’ve paid for repairs or a new pallet. Instead you should look at the cost over the whole life of a pallet and how different types could bring you savings in other areas of the business. Don’t be tempted to buy from the first supplier you find, just because you think you’ve got a good deal. Research exactly what’s available, and look at what each one has to offer. The services they provide may vary, such as being able to supply express despatch and shipping options or having a more extensive range. It’s also important that your supplier understands the latest regulations regarding pallet shipping rates and logistics, so that they can provide you with a comprehensive package. Used plastic pallets suppliers will often give discounts for customers who are buying in bulk, or they may operate a loyalty discount scheme. If you don’t have a need for a large number of pallets, you could look at teaming up with another local business and buy together to reduce the cost. You might be able to cover some of the cost of purchasing pallets through a partner business. Consider selling your goods as a complete pallet, which will include the initial cost in the sale. If you want to start working in this way, you need to choose a type of pallet that works for both of you. This way it will be compatible with your customer’s equipment and machinery. What Is the Right Pallet? You should think about exactly what you will be using it for, as this will dictate which the right pallet for your business is. The majority of pallets are either plastic or wooden, each of which has its own benefits. Plastic pallets are generally more durable and hygienic, whereas wooden ones are cheaper to purchase initially and are a good choice for one-way shipments. Whichever type of pallet you end up buying, doing some research beforehand is critical if you want to save yourself time and money. Pallets are now a vital part of logistics, and while the vast majority of those currently in use are made from wood, there are many advantages of plastic pallets which are just waiting to be uncovered. These benefits are still somewhat of a secret in many quarters, but take a look at the following attributes of plastic pallets, and you might well want to join a growing number of people and businesses who are choosing to make the switch from wood. Wooden pallets can suffer from supply issues as a result of competing with lumber companies for materials. This is not the case with plastic pallets. One of the other major differences between plastic and wooden pallets is that the former can be melted down and remade when their original life cycle ends. Another of the advantages of plastic pallets is that they are not regulated in the same way as wood, and goods do not have to be repacked to enter certain countries because of rules focusing on the timber used. This minimises the potential for delays in international shipping and boosts productivity and efficiency. Tracking devices can easily be attached to plastic pallets, unlike with wooden versions. These can allow for the monitoring of loads, and they are particularly helpful when shipping perishable items such as food, as they can improve both accountability and efficiency for businesses. A major advantage of plastic pallets is that less maintenance is required than when wooden pallets are used. They are extremely easy to keep clean, and any hazardous spills can quickly be washed off. Plastic pallets can also be sanitised easily, and they can be safer to handle due to a lack of sharp edges. They do not present the same type of fire hazard as wooden pallets, either, meaning that they can be stored inside, and their surface is non-skid, adding to safety when being shipped and handled. Another benefit is that they do not shed and leave behind a mess. As well as avoiding safety issues with splintered wood, broken boards or protruding nails, plastic pallets can often be easier to handle because of the way they keep their shape, do not warp and do not collapse in transit. They can also be lighter to move than wooden versions and allow for four-sided entry. This boosts flexibility in terms of storage and saves time by allowing a forklift or pallet jack to pick them up from any side. The design of plastic pallets means that they can often be stacked higher and can be kept nesting inside each other to save on space. The added convenience offered by plastic pallets does not mean a compromise on strength, either. One-way pallets usually have dynamic weights of as much as 2,000lbs, and heavy-duty versions can handle up to 3,500lbs. All of this adds up to a storage and handling solution which lasts longer, is easier to use and is simpler to store than wooden pallets.